Phone All-Out Fencing Inc. at (250) 739-2950 for a FREE quote! All-Out Fencing has done a variety of jobs for us including a cedar fence, a retaining wall, as well as our back deck. They are a pleasure to be around and do great work! All-Out Fencing is not a landscaping company. We’re not “jack-of-all-trades”. We’re not students working for the summer. We’re a friendly fencing company – based out of Nanaimo, BC – that can complete your project professionally: on time, on budget. If you need a fence built, you’re in the right place. All-Out fencing builds quality residential, industrial, and commercial fencing in Central Vancouver Island. No terrain is too tricky, and we have a creative side as well. We’ll plan and build the best fence for your needs and budget. We are a flexible and reliable company that isn’t afraid of hard work. (250) 739-2950 or emailContact us to arrange your free estimate. We are ready to go “All-Out” and build your fence right – get ahold of us for a free estimate. Phone (250) 739-2950 or contact us by Email. 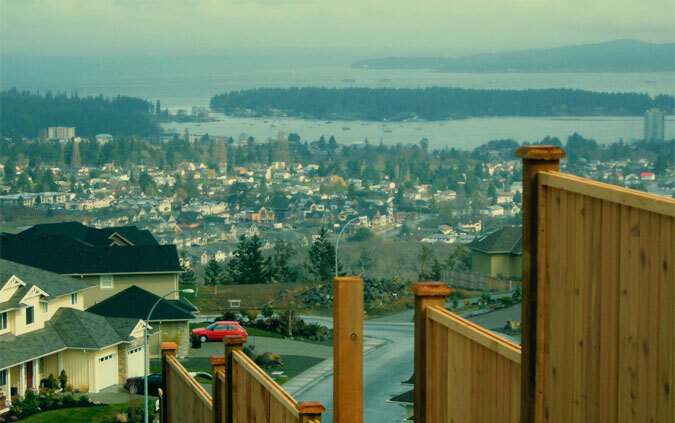 All-Out Fencing Inc. is based out of beautiful Nanaimo, BC, and services all of Central Vancouver Island. Our territory includes Nanaimo, Nanoose Bay, Lantzville, Cedar, Parksville, Ladysmith, Duncan, and Qualicum. Remember: always consult with your local building codes before building. Much like a custom cedar fence, this website was hand-crafted. If you’d like your own website, contact Richard the Brave.